The 2016 Olympics kicked off in Rio, Brazil with the opening ceremony on August 5th. During the event there was acknowledgement of climate change with images that illustrated rising temperatures, melting polar ice caps, and rising sea levels. 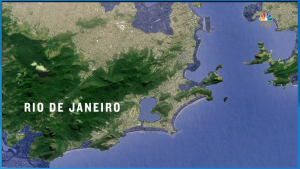 Following these images there was narration about how the host country would plant a seed for each athlete after the ceremony, implying that this could be one way to combat deforestation and climate change (of course, this gesture doesn’t change the various scandals and incidents preceding the games in Rio). The projected sea level rise in Rio, shown during the opening ceremony of the 2016 Olympic Games. Surprisingly (or not), the causes of climate change and deforestation were never mentioned (much less any strategies to adapt). 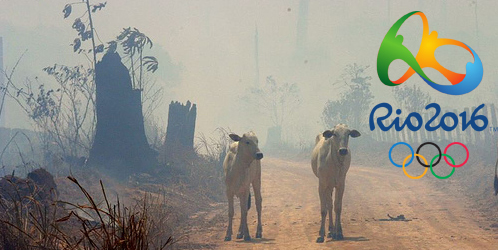 Brighter Green has researched these issues extensively (in Brazil, and other countries) showing how an expanding livestock sector, especially cattle and soybean production—an integral component of farmed animal feed—are the main drivers of deforestation and climate change in Brazil. 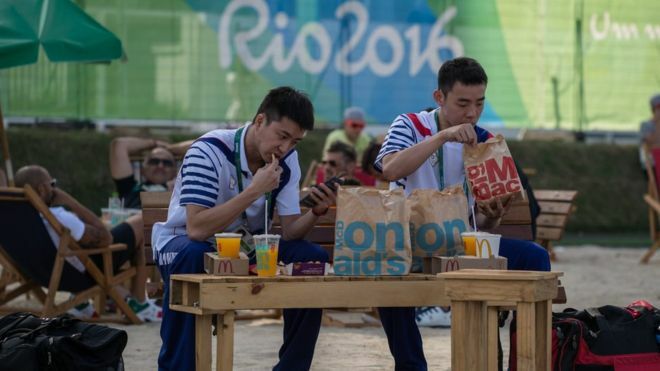 Perhaps this is no small surprise, given the Olympic sponsors that rely on big ag to supply their products (McDonalds, Coca-Cola, and Dow Chemical to name a few). There is a sustainability plan in place for the Olympics, which includes sustainable food sourcing, and is further explained in their thirty-two page Taste of the Games publication. However, their qualifications for sustainably-sourced beef, for example, are that providers have “signed up for zero deforestation” or have a system of practices—of which there is no known regulation—encompassing social, environmental and animal welfare practices. There is no mention of reducing the consumption of animal products or options for eating vegetarian or vegan, as either an athlete or spectator. We were interested in getting insight from local experts to shed some light on this situation. Recently, we conducted the first of two live chats in our WeChat group focusing specifically on Brazil. As part of these chats, we reached out to a few of our colleagues based in Brazil to ask about veg*sm and related issues. This included the former president of the Brazilian Vegetarian Society (Sociedade Vegetariana Brasileira or SVB), Marly Winkler. Winkler also wrote that it is very easy to be vegetarian in Brazil because there is plenty of access to vegetables and fruits, but the meat-centric culture is what makes it more difficult. 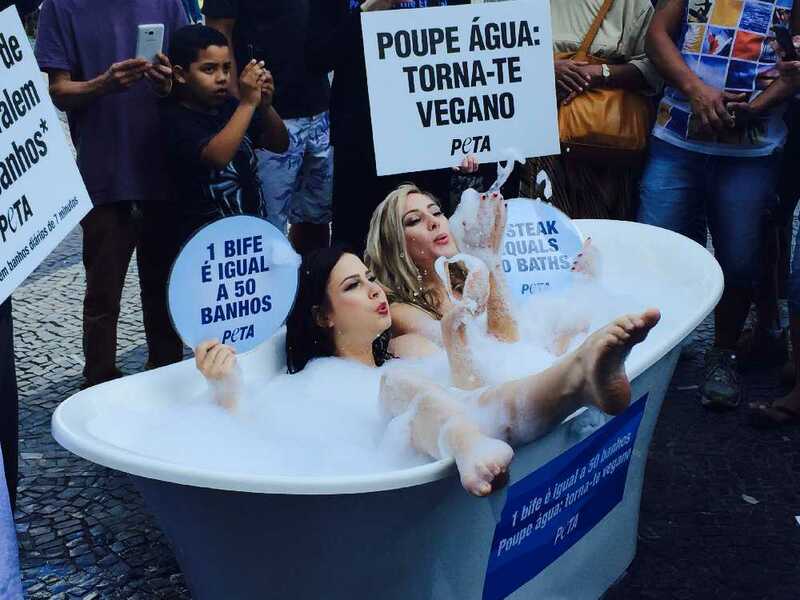 PETA protested in the city center on August 4 to show the Ultimately, it seems like athletes and visitors will have access to vegetarian and vegan meals, but it will be interesting to see if they actually take advantage of it. Plenty of plant-based athletes have enjoyed success at the Olympics, and beyond.